Jessica Ann is the local protector of the wild ducks that choose this area to breed. 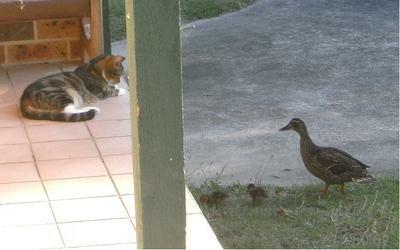 She stands guard over the ducklings against other cats and even dogs. Of course her food bill is an average of sixty dollars a fortnight but worth every penny of that. Jessica Ann just turned up on the next door neighbors doorstep when she was about six weeks old. When the neighbor passed away last year she just moved in with me. Now she won't go more than thirty yards from the house as that is her special domain. Editor's note: Too cute! Thanks for sharing, Peter. Animals today, and especially, are doing things that traditionally they didn't normally do, like cats protecting ducks, or mice, or hamsters. And the list goes on. Lovely little kitty. You never know how they will turn out but this is good! What an awesome little kitty!